As a child – so tiny and delicate that her father calls her fairy – Morgan has a special relationship with nature, for she can hear the Silence, the harmonising force that creates and sustains all things. The humming of the Silence is her secret, even from her beloved father, as is the day that she walks along a cobweb. But with adolescence comes a loss of childhood innocence and the intrusion into her perfect world of an unwanted step-mother and baby sister. These loud and chaotic presences, together with an act, as she percieves it, of unwarranted violence by her father, have a traumatic effect on Morgan. Sent by her father to get hlep – for the family has been trapped in a fall-out shelter for days – Morgan, a dwarf, goes instead on an odyssey into the unknown, seemingly hostile, world outside her home. Mourning the disappearance of magic from her life and realising for the first time that she is physically deformed, Morgan learns that only through love can she regain her empathy with the Silence and the ability to transcend the boundaries that enclose other people. In this, her first novel, Sara Banerji has created a work of startling originality and beauty. 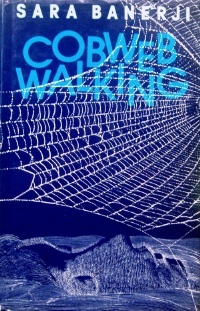 Full of vivid images, Cobwebwalking is a perceptive story about shattered childhood dreams and the painful awakening to self-awareness.